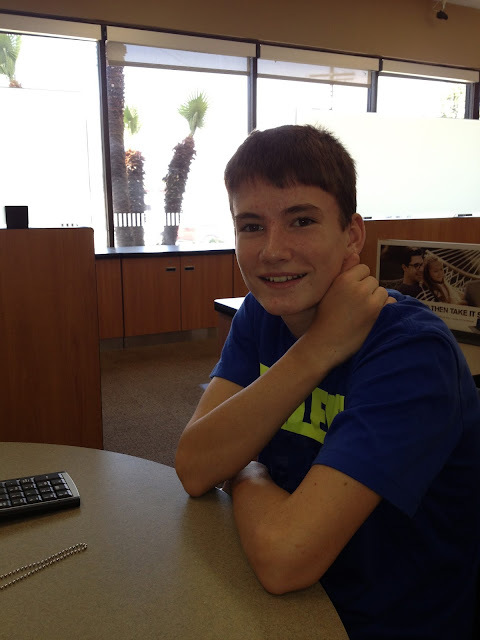 The day I picked Aiden up at the airport after his summer visit in Arizona, he requested two things: a haircut and a bank account. I expected both. Aiden got a summer job this year and for the time he was home, earned pretty good money. I have tried to instill good financial principles in the kids. First, they pay their tithing, right off the bat. 10%. Of what's left, half goes into savings, and the other half is theirs to do with as they please. 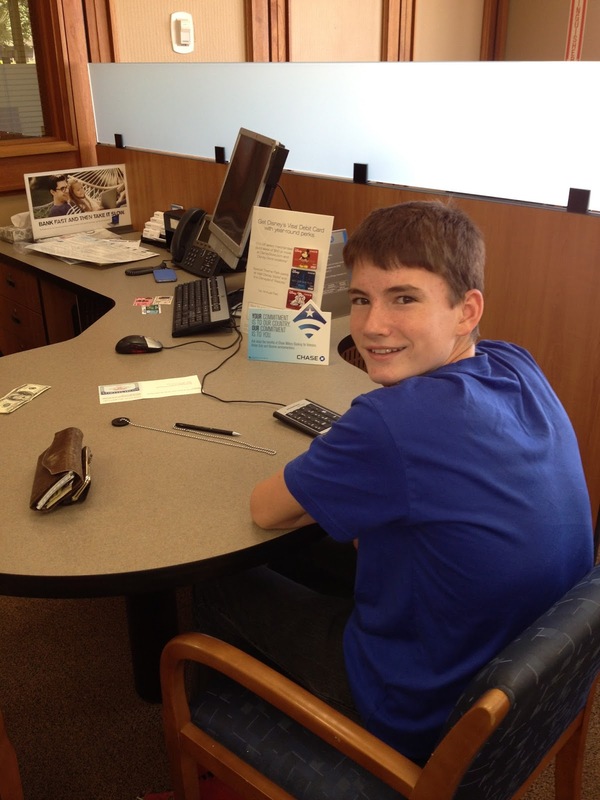 Because Aiden had "real" money to work with, he wanted a checking account. 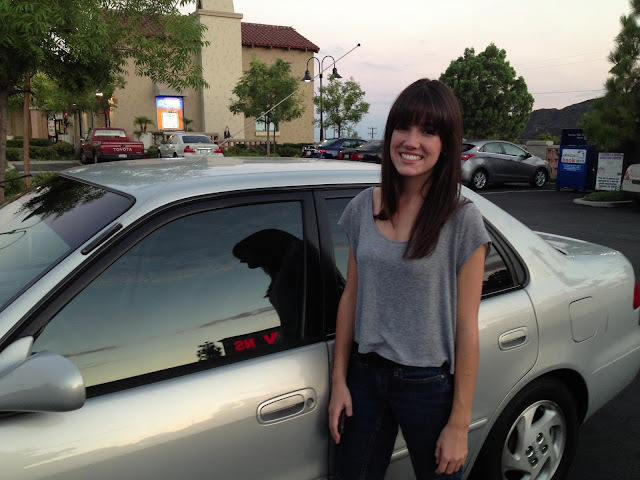 Lyndsay got her checking account when she was 16, because that's what Bank of America allows. Chase, however, (Aiden researched) allows younger teens to open an account as long as a parent also has an account. So, I opened a small account, in order to help Aiden open his. He was so excited, there was no way I could turn him down. 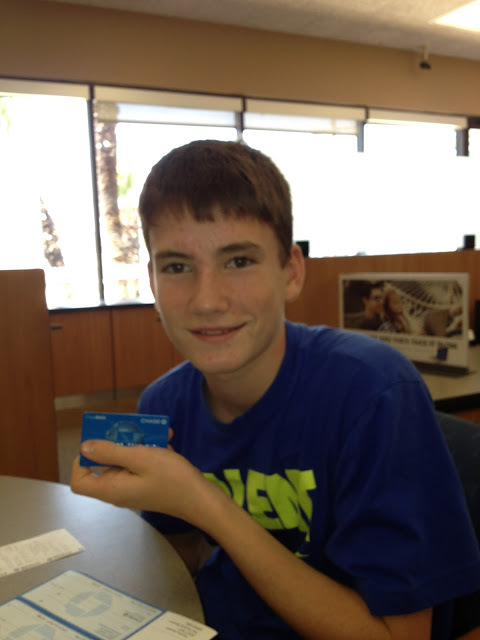 Here he is, the proud owner of his very own debit card. It's great practice for him. I keep the kids' savings accounts separately. When Lyndsay went off to college, I transferred the balance of her savings account to her checking account, so she now has stewardship over all of the money she's saved. Although Lyns made it through her first year of college without a car, and actually planned to do another year, because she is in an off-campus apartment this year we decided it might be best to just try and find one. She was home all summer working and using my car, which was a little restricting, but since I haven't found a job yet, it was doable. She was thinking she would spend up to $5500 (total) on a little car. But the last week she was home, we found one on Craigslist for $2900, and it seemed perfect. She preferred to have a cheaper car and more money in the bank than having a bit nicer/newer of a car and less cash. 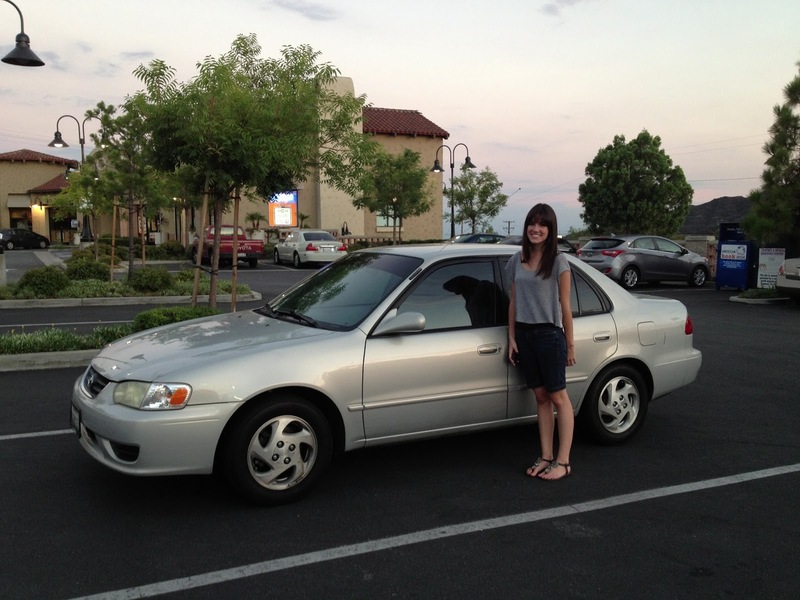 The money she has saved brings her so much security and it scared her to spend so much, so we went with this 2001 Toyota Corolla. We had it checked by two mechanics before buying it, to make sure there were no surprises. Her first car! She paid for everything herself! We did put new front brakes on, new windshield wipers, and got an oil change and fluid top-off. We got it smogged and went to the blasted DMV and got it registered in her name. She paid for it all. And in total, it was under $3500. I'm so proud of her! She looks so cute in it, doesn't she? I think it's the perfect first car for her, safe and reliable. 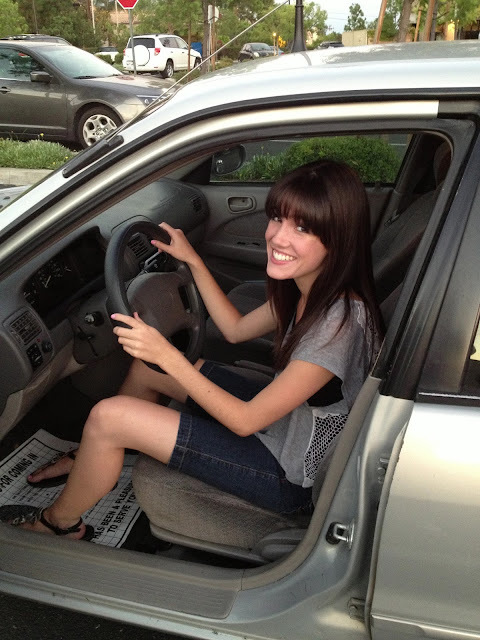 In fact, today she arrived back up at BYU, driving all by herself! It will be much easier for her to manage this year of laundromat, grocery shopping, and cold weather, without having to rely on a roommate's car. And I imagine she'll love the freedom of coming home whenever she can as well. I know Dylan has been working every spare second too. He's had a job near his home in Arizona and he goes there right after school and on weekends. Hopefully, he's saving! I know he really wants a car as well, and of course college is fast approaching. I have been surprised at how many of my kids' friends (especially the older ones) have never had a job or have never had to earn money or pay for anything themselves. Things just seem to be given to them. That seems nice in the short-term, but a bit debilitating in the long run. I want my children working for money as soon as they are able. They don't pay for everything, but they can help share the cost of things they want and need, and it takes a lot of practice to be good at budgeting and using money wisely. I would rather the kids learn those lessons young and while they are still in a relative safety net. I think my struggles have made an impact on them as well. They see the problems that come when there isn't enough money, and they've learned ways to make do with very little and make thoughtful choices, which sometimes means saying no and doing without. Even meager incomes can be handled well, and I always tell them that if they can't handle a little money, they won't be able to handle a lot!